OUR NEXT MEETING, Tuesday 20th May 2014. Our next Meeting Saturday 8th March. when they are blooming it will be worthwhile having a picnic / meeting there. Christmas Lunch The OX, Oxley Ave, Margate, 11 /45 am. Please wear Christmas Colors, Bright Happy Faces,lets celebrate what we've achieved in this last year. Hi everyone tonight on ABC @ 8 pm Australian Story is the rest of the Jan Russ story,must see show. opposite the Westfield Shopping Center Gympie Road, Srathpine. For further details please contact Trish 0417077159.
gets very busy at lunch time, many meals are about the $10-00 price range. All membership payments now due. 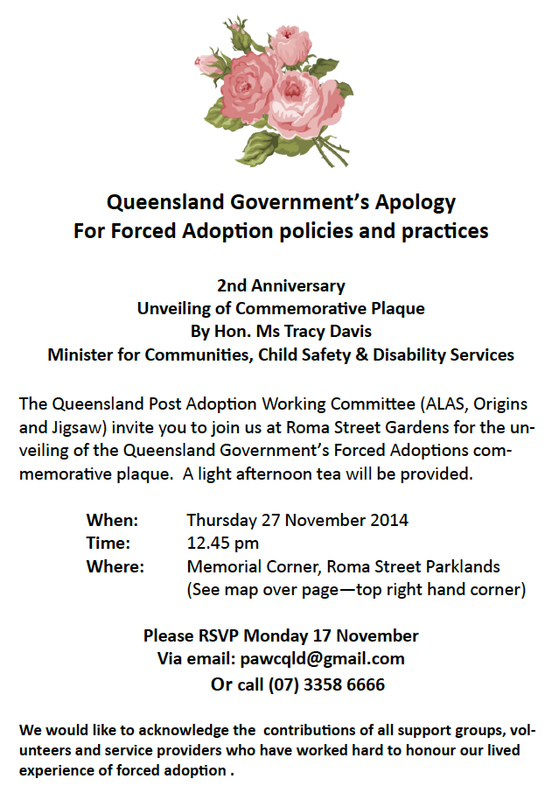 The Queensland Government Adoption Apology 2 nd Anniversary. 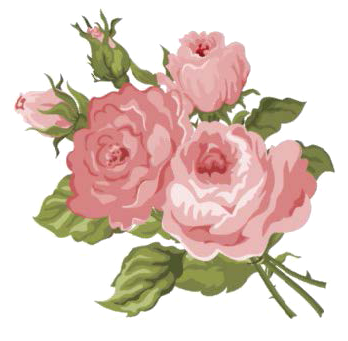 in Brass, also a Beautiful Pink Rose will be planted. 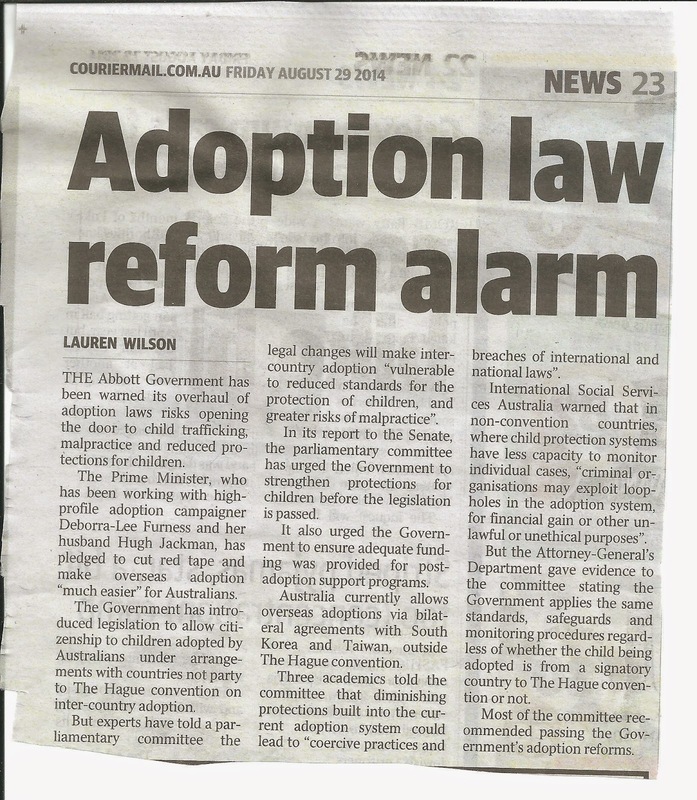 could go and reflect ,The Government Acknowledging Former Forced Adoptions. Looking forward to this great day,after many years of hard work by so many people, to get the Queensland Governments Adoption Apology, we at ALAS hope as many people affected by Adoption can come along. Ladies after lodging submissions against these adoption law changes to go ahead, the men in parliament ignored us, they have not heeded the warnings of the past ADOPTION wrongs!. Will they apologise to the overseas families whose children end up being adopted by Australian couples. How long will it be before we have another GENERATION of OVERSEAS STOLEN BABIES OR CHILDREN? To satisfy the Australian BABY MARKET.! Infertile couples do not have the right to expect to take another woman's child causing post traumatic stress disorder. Time; 11 45 am onwards. AGM and Annual membership $20.00 fees due 15th July 2014. I started writing this blog in 2009 to help work towards having the truth told for the Inquiry and both State and Federal apologies for Forced Adoption. In 2012, the Queensland Parliament gave their apology and stated that practices used for forced adoption was Illegal. This is the only State to have that word illegal included in their apology. On 21st March 2013, Prime Minister Julia Gillard gave a heartfelt apology for forced adoption. I have been privileged to have been able to attend both of these special days. Nine months later and even before the 1st anniversary of the Federal apology, Tony Abbott has announced that he will make adoption easier in our country. My heart goes out to the future mothers who will lose their children, and to the children who will lose their families and heritage to adoption. In 20 years time, mothers and their lost children will again have to fight for their rights. Why do adoptive parents never consider that children were born to their own parents and not found under a cabbage, and that their loss is greater than their desire to call someone else’s child theirs? With over 94,000 people who have read this blog, I would like to say thank you for all your support. I am a mother who had a son taken by forced adoption and, through this blog, gave me a voice to fight for acknowledgement to have the truth of what happened to mothers and children in this country heard both here and around the world. It is now time for me to hand this over to concentrate on my family which has been sadly neglected over the years. My thanks to Claire Hamilton for helping me set up this blog and gave me the skills to maintain it. This is my last post for the blog. It is now time for me to say goodbye and again, a big thank you.I am sure I am leaving it in good hands. Senator Sue Boyce while heading overseas, wore our ribbon in remembrance of the National Apology for Forced Adoptions on the first anniversary 21st March 2014. We are thrilled at the number of ribbons that were worn on this special day. .Glenda, Marg and Trish were there. Our posters read, TAKE OUR REMEMBRANCE DAY, NOT IN MY NAME MR ABBOTT.We had the emblem from the National Apology for Forced Adoptions 21st March 2013. For all who are unaware, Tony Abhbott has given this date to the Afghanistan Veterans. We have been in contact with the Veterans and they did not know that this was a special day for people affected by forced adoptions. We are in communication with the Veterans. Tony Abbott, seems to have forgotten that, along with Julia Gillard's apology he also apologised, and even before the 1st anniversary of the apology he has forgotten us. We were suprised how many people stopped us to find out what our signs meant and we had our photos taken many times. Although it was an extremely hot day we marched from Queens Park, along George Street, down Adelaide to Edward and then walked up beside the gardens to Parliament House. There we re-grouped for the march back along George street to the park. The march was well organised and ran without incident. We were suprised how little coverage the march was given by all the media. Very disappointing effort considering the march was held in all capital cities along with many other large towns.! 1st Anniversary Rememberance Day of Forced Adoption Apology. On Friday 21st March 2014, we will remember the1st anniversary of the Apology for Forced Adoptions given by the then Prime Minister Julia Gillard and Tony Abbott at a lunch at Seaview Hotel, Pier St Shorncliffe. There is a $10 lunch menu available. RSVP; by Wednesday 19th March. We would like to see as many as possible to remember those who are no longer with us and to celebrate the huge effort by all to achieve this apology. 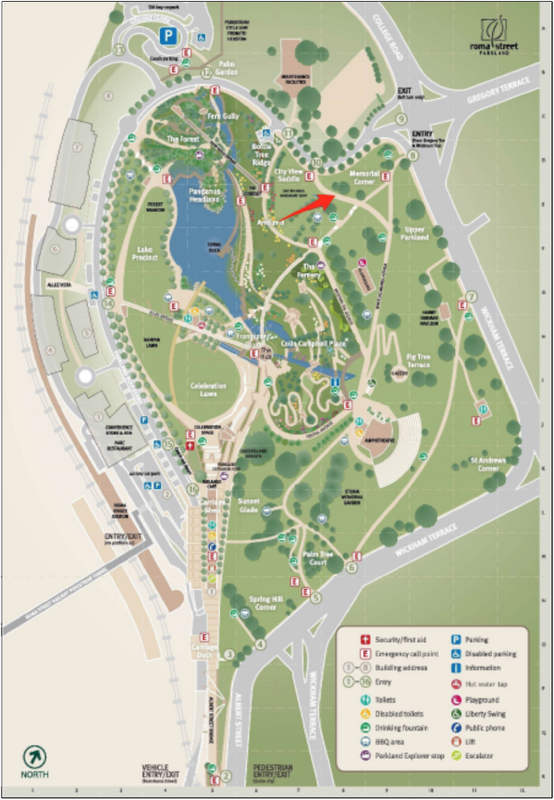 Our next meeting will be this Saturday 8th March. There will be much to discuss about the new changes to the child safety laws. While they "appear" to be good in theory, the new laws will still have to refer to the old adoption laws. Adoption will still have secrecy of records being closed and allowing for the child's name to be changed therefore eliminating the child' identity. ALAS would like to hold a Rememberance Day Lunch for the coming 1st anniversary of the National Apology for Forced Adoptions, 21st March 2014. This will be discussed also. National Apology for Forced Adoption 1st Anniversary. 21st March 2014. Benevolent Society's Post Adoption Support Qld, (PASQ) invite you to join us for a morning tea at the Benevolent Society Head Office. Where; Benevolent society, 9 Wilson St., West End Qld 4101. Time; 10 30- 1230 noon.Light morning tea provided. 07 3170 4600 or 1300 914 819. Lest We Forget. Prime Minister Abbott Certainly Has! It Seems 21st March The Date of the Federal Apology for Forced Adoptions Has Been Given to Others. AUSTRALIA is to have an Anzac Day-style national commemoration for the war in Afghanistan, to ensure the bitter experience of returning Vietnam veterans is not repeated for those who have served in Australia’s longest war. March 21 next year - a month before the centenary of the landing of the Anzacs at Gallipoli - will be the first national day of commemoration for the war in Afghanistan, in which 40 servicemen have lost their lives. The government intends to stage the commemoration once, leaving open the possibility that it could become an annual event. Tony Abbott will announce the new commemoration in Darwin at a welcome home for troops who served in Afghanistan or as part of Operation Slipper in the Middle East, which includes those who served on bases in the emirates or naval operations in the Persian Gulf. State governments have agreed on a national day of commemoration but it will not be a public holiday like Anzac Day. The Prime Minister wants to ensure there is “appropriate recognition” of the service personnel from Operation Slipper and that a lack of recognition for troops - as was the case for those returning from Vietnam - is not repeated while he is in office. A month after he became Prime Minister last year, Mr Abbott went to Afghanistan with Bill Shorten for a special ceremony at the Australian base in Tarin Kowt in Oruzgan province to mark Australia’s withdrawal. Mr Abbott told the troops and Afghan leaders that “Australia’s longest war is ending”. “Not with victory, not with defeat, but with, we hope, an Afghanistan that is better for our presence here,” he said. Two weeks ago, Mr Abbott announced that Australia’s 100th Victoria Cross was being awarded posthumously to Australian commando Corporal Cameron Baird, the serviceman most recently killed in Afghanistan, last June. Over more than a decade, nearly 30,000 Australian men and women have served in and around the conflict in the valleys and mountains of Afghanistan. Apart from those who have died, more than 260 have been wounded. At the height of the war, there were 1550 Australian army, navy and RAAF personnel in Afghanistan. Australia still has 400 personnel serving in Afghanistan who, defence chief David Hurley says, are still in considerable danger, especially from “insider” attacks by rogue Afghan soldiers. General Hurley told a Senate estimates committee hearing this week that Australian instructors and mentors, based mainly in or near Kabul and Kandahar, were being guarded by Australian and British troops. “Despite the ANSF’s (Afghan National Security Forces’) marked improvement and our change in posture we should not underestimate the threat,” General Hurley told senators. With many other days to choose from Tony Abbott has shown us no respect for the trauma and loss of having our babies taken by Forced Adoption. This day should be OUR day!